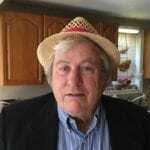 Home Investigative Stories 911 Where Are You? NASHVILLE, TN – It was a dark and stormy night last Thursday when the remnants of Hurricane Harvey came to town. 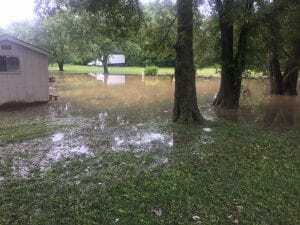 Beginning around 6 pm tornado warnings wailed and sirens shrieked as heavy rains lashed the region and creeks quickly swelled beyond their banks. It could have been much worse. Harvey brought more than 50 inches of rain to some parts of Houston last week. Nashville got less than 2 inches. 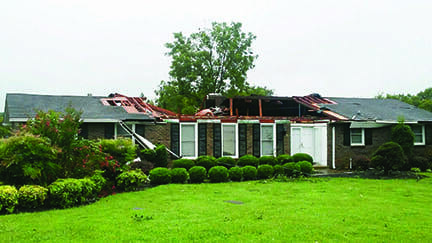 However, the National Weather Service (NWS) reported a tornado hit near Bordeaux at around 1130 pm CDT Thursday night . “It traveled to the northwest and was on the ground for about 2 minutes. The strongest winds were estimated to be around 95 MPH. These winds removed a large portion of a roof from a wood frame house. It also removed shingles from a few homes and collapsed two carports. 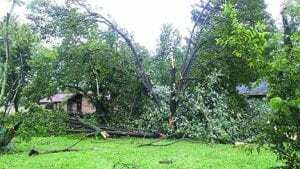 The tornado snapped or uprooted nearly 100 large mature hardwood trees,” wrote the NWS. District 1 Councilman Nick Leonardo’s phone started ringing off the hook late Thursday night. Most residents reported flooding in their neighborhood. But Leonardo also got calls and emails about clogged culverts and drainage ditches stopped by debris. “No metro agencies reached out to say what can we do to help your district or what resources do you need? Is everyone ok? I was just shocked,” he said. Leonard said about 20 people from his district evacuated to the First Baptist Church in Joelton. The Nashville Red Cross shelter took in 30 people that night from other parts of the city. “I didn’t hear from anybody in the Metro system and I have yet to hear from anyone,” Leonardo said. Since nobody called him, he got on the phone. He called John Honeysucker from the Water Department. The two men drove around in Leonardo’s pick-up truck for a couple hours assessing the damage. And they had downed trees in their yards and twisted gutters and blown away roofs. “I would have thought I would have heard from OEM or the Mayor’s office,” Leonardo said. Metro’s Office of Emergency Management got forty-seven calls from Bordeaux when the storm struck and in the hours following its departure on Friday. The calls reported downed trees and/or flooding. According to the quality assurance department of the OEM, police cars or fire units were dispatched to each of those calls.